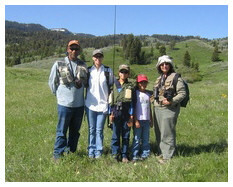 For years my kids and Carla, my wife, followed me up and down streams and rivers fly fishing. Drake is eight and Annie is six. 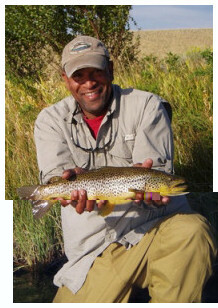 I have annually traveled to Montana for fly-fishing trips with my friends, but 2007 was the beginning of a new era in the life for the Jones' family. It started when Santa Claus brought Drake his first fly rod for Christmas, 2006. We planned a family fly-fishing trip that morning. The first time I went to Ennis, Montana, before we had children, I had no fly-casting skills. Although floating the Madison River is a beautiful experience, I spent most of my day untangling the fly line and only caught one very small fish. But now, because of my son, our goal was for Drake to learn how to cast a fly rod before summer. 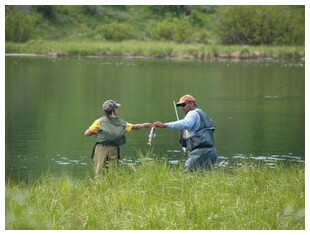 Casting is an integral part of fly-fishing. We practiced casting in the horse pasture. The local fly-fishing club offered free casting lessons. Drake and I participated and continued through the winter casting at small lakes near our home. As winter turned to spring, and the snow melted in the mountains, we fly-fished the Kaweah River nearby. On April 28, 2007 Drake caught his first trout on a fly rod. Not only was Drake catching fish regularly, but Carla was also. We booked guides to take us down the Madison River. As we planned our trip we invited my mother Shirley. She is an artist, writer, photographer and bird watcher. My daughter Annie enjoys many of the same interests as my mother. So if Annie did not want to fish, she could spend time with Granny. The house is located eight miles south of Ennis at the base of the mountains. We unloaded our stuff, and headed up the mountain to Haypress Lake. The trout were feeding on insects on the surface of the water. We tried just about every fly in my box, but only enticed two fish to bite. There were more days of lake fishing and we looked forward to the float trip down the river, hoping for better luck as the week progressed. 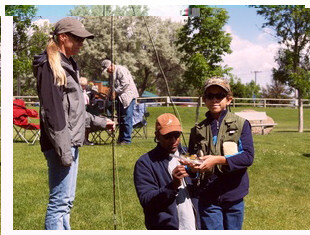 The town of Ennis hosted a fishing derby on Father's Day for kids only. Drake almost landed the biggest trout I have ever seen, but it fell off the hook at the shore. Drake and I woke up early one morning and headed down a section of river near the house. We crossed Varney Bridge and parked at the boat ramp. We put on our waders and waded into the river. We were on the clock because we promised the ladies we would be back at the house by 10:00 a.m. While we were fishing several guides were launching drift boats. Drake is a great caster for being so young. He has style and some of the guides and their clients were watching him cast. About the fourth cast he mended his line and watched his fly. Suddenly, there was a huge splash and a very big trout jumped out of the water. The trout took the fly and ran down stream, turning Drake. I had to grab Drake to keep the fish from pulling him from the boat. The trout leaped out of the water again and broke from the line. Applause was heard, and when we turned people on the shore were clapping. Drake now had his "one that got away story". We realized we needed to head back to the house. As we waded back to the shore people congratulated Drake. On our last day in Montana we met the guides, Chris and Jim, at the Tackle Shop. Carla, Drake and I wanted to fish all day, but we weren't sure if Granny and Annie were ready for eight hours on the river. We took our vehicle and parked it at the halfway point just in case. We launched the drift boats at Varny Bridge eight miles from town. Carla, Annie and Granny were in Jim's boat, and Drake and I were with Chris. Drake landed his first Madison River Rainbow Trout five minutes down the river. Carla is not big on fly-fishing. While we always bring the kids with us to fish, she is usually watching Annie. It was great for her to receive some one-on-one instruction from the guide. Granny and Annie were busy identifying birds. The fishing was a little slow but Carla was catching fish. We kept count of how many fish we caught. All day Carla was a couple of fish ahead of Drake and me. At the half way point we had lunch. Annie and Granny were having such a nice time watching birds and the scenery that they decided to continue the rest of the day. Annie switched to Chris's boat to be with Dad. Finally, I hooked a big German Brown trout. It took awhile to land the fish. Meanwhile Carla was catching more fish and still ahead. Every time Carla caught a fish she signaled with her fingers to show off her count. Granny took pictures and enjoyed the outstanding view of the Madison Valley. The afternoon passed as we floated down the river. My son made great casts. My wife caught more fish than me. Granny and Annie enjoyed the boat ride with an ever-increasing bird list. I thought to myslef how lucky I was to have a family that enjoys the outdoors. We had been on the river for eight hours and nobody wanted the day to end. As we climbed into the vehicle, Drake asked to stop at the Varny Bridge, or the Lions Club Pond on the way back to the house. "Dad, just one more fish?" Granny said, "Drake, you've caught so many fish, and it's been eight hours on the river. Don't you think that is enough?" Drake smiled and said, "Granny, you can't catch too many fish."